A Syrian rescue worker has been filmed breaking down in tears as he heroically pulled a 30-day-old baby girl from the rubble of a bombed building in the city of Idlib on Thursday. 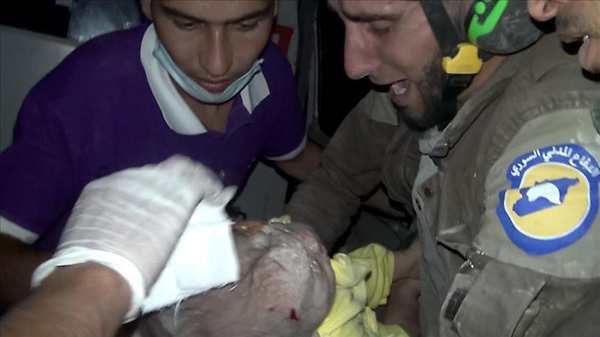 White Helmets volunteer Abu Kifah recovered the girl alive after two hours of desperate digging and held her close before the pair were rushed off in an ambulance to one of Syria’s horrendously overcrowded hospitals. At least 11 civilians, including seven children, died during attacks on Idlib, nearby Jarjanaz and central Hama province on Thursday, the Syrian Observatory for Human Rights said.